The 1960’s was a unique and magical time in many parts of our great country, but in nowhere was it more so than in San Francisco, California. “Babylon by the Bay” was always, and still is, a special city beloved by anyone whoever visits or has lived there, and is an area of creativity and innovation. The music scene in the early 60’s was alive with classical, jazz and folk music scenes that blended and morphed into a music genre that exploded out of San Francisco and took over the world. Along with groups coming up the Coast from Los Angeles, San Francisco was home to a new music scene that spread out to many other art disciplines, including graphic design. Far out creative concerts opened the door for equally experimental concert posters, and like the early 1900’s in Europe, a new Genre was born. The two main concert promoters of the San Francisco music scene, Chet Helms (The Family Dog) at the Avalon Ballroom and Bill Graham (Bill Graham Presents) at the Fillmore Auditorium, promoted their concerts with posters created by young local artists. These artists had very few restrictions put upon them and the creativity flourished and opened up a style that is still relevant today. I lived in Portland, Oregon, and the vibes came shooting up the coast to the Pacific Northwest. In 1966 we had just moved into the smallest (and coolest) house in the west hills. Shortly thereafter, Signe and Jerry Anderson moved into her mom's house a few doors away from mine. She had just returned from San Francisco, where she was the lead singer for an obscure but rising SF band, The Jefferson Airplane. She left the scene in SF because she was pregnant and did not want raise her soon to be daughter in the drug crazed psychedelic scene San Francisco had become. We shared a backyard, my wife and I had just had a daughter, Erin, Signe was in the same class as my sister Irene at Lincoln High School, and we became close friends. Jerry and I did all the things young men did in those days, fast cars, the occasional recreational drugs, and an appreciation for pretty things. 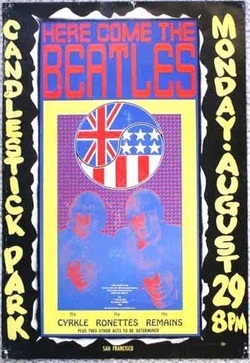 Jerry had a stack of posters from some of the events the Airplane and other early San Francisco groups had performed at, but Jerry had trouble with possessions (he tended to destroy things he loved), and somehow I ended up with these posters. Of course I tacked them up on my walls and enjoyed them. These posters became the nucleus of my collection. Also, my good friend Fred Lackaff had started a band, The New Tweedy Brothers, with his brother Danny, and they and Stevie and Fang went to San Francisco to make their fortune, or at least some music. Fred brought me a couple of posters when the band returned home to Portland. So, I had a bunch of early Family Dog and Bill Graham posters that, when I moved from my little house to a dome in the woods (it was the late 60’s after all) I put all the posters in a film box and forgot them for 30 years. Fast forward, I am living in Arcata, California, and rediscover my treasure trove. I start doing some research (the internet is really starting to become a powerful tool), and discover the artistic and monetary value of the posters I have. 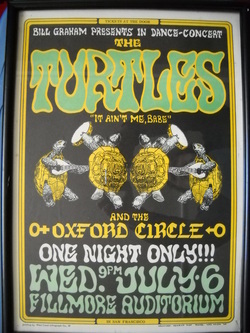 I contacted Eric King, the SF poster guru, and with his incredible kindness and direction (not to mention his scholarly guide to San Francisco rock posters that made collecting them possible) I started down the path as a serious collector. I decided to concentrate on the Family Dog series because I had more early first editions, and I liked the diversity and breadth of design of the Family Dog series more than the Bill Graham series. I had maybe 20 or so of the earliest Posters, and over the next 12 years I slowly was able to collect the rest of the numbered series, 147 posters, plus the Denver Dog series of 13 posters that were not included in the regular series. To this end I will forever be grateful to Grant at San Francisco Rock Posters, who really got me started on the right path. These posters are icons of an era that will not be seen again and have influenced the field of graphic design since their inception. They show the life and humor of a time when we were all struggling just to understand our place on this little planet. Thank heavens for the diversion.